Join us as we check out the first mixed-use development of its kind in downtown Raleigh's warehouse district. 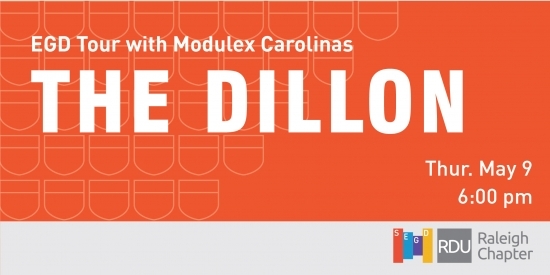 Hosted by Modulex Carolinas,we will tour The Dillonwhile enjoying some wine, beer and light appetizers. Representatives from Kane Realtywill discuss details of how the project originated and the emphasis on keeping the Dillon property intact. Contact your chapter chairs,Emma, Allison and Elizabeth with any questions or to get on our mailing list. A huge 'thank you' goes out to the Koroseal Digital + WeaveUpfor hosting such a creative and colorful event. The maker-space vibe at WeaveUp garnered oooh’s and ahhh’s from the SEGD RDU crowd. Laura Cavendar with Koroseal and Steve De Santis with WeaveUp created a pre-event design activity for the attendees. We got to play on the WeaveUp site the week before and customize a pattern with a few clicks of a button, changing the color theme, pattern repeat and scale through the user-friendly online interface. The custom samples, printed just days before the event, lined the WeaveUp tables as we entered the space. The colorful display showcased the range of creativity from our design members, WeaveUp’s variety of patterns and fast ability to customize designs, and Koroseal’s gorgeous wall coverings and high-quality printing capabilities. We learned how the meta-data for each custom sample is directly printed onto the sample’s top edge, making the Koroseal Digital + WeaveUp partnership an easy, no-error process when selecting final samples with clients and the product ordering process. With just a 2-3 day turn-around for samples, designers have the ability to explore patterns and obtain a range of samples to find the perfect color and pattern match for their design project. Many of us designers emphatically nodded our heads ‘YES’ when we learned that just a quick click of a button, product specs with a thumbnail image are instantaneously created in a PDF for our custom design, to be used for bid packages, project specifications and ordering purposes. By simply changing the color combinations and themes, or modifying the pattern repeat and even the scale, the endless combinations on the WeaveUp interface allows creativity to flourish with a fast click of a button. Our ears perked up when us designers realized we could have a good side hustle. You can create a unique design, upload it to the WeaveUpsite and if it’s selected for use on a project, royalty fees are paid to you. Two thumbs up for WeaveUp’s ingenuity and a round of applause for the smart partnership between Koroseal Digital + WeaveUp to ensure color accuracy, ultimate customization capabilities and industry-leading, digitally printed wall coverings. Fun facts of the night, Korosealmanufacturers, designs, prints and distributes their own wall covering products, a rarity in the wall covering world. In addition, Koroseal will take ANY vinyl wall covering (their brand or not) and will reclaim, recycle and reuse the content into other building products! How’s that for full-circle? The evening ended with a door prize drawing for the colorful Huesteria™clutch using #huesteria! Congrats to Jennifer for walking home with a fun new, designer accessory. Consider yourself an artist? This is your chance to learn how your designs can end up on Korosealproducts through WeaveUp. Join us on Thursday, March 21 for wine, cheese, and inspiration. Koroseal is proud to partner with WeaveUp to offer custom digitally printed wallcoverings. You have complete control over the scale, repeat, and colors for most of WeaveUp’s 10,000 designs. With a wide variety of Koroseal substrates to print on, the possibilities are endless. SEGD Raleigh-regulars got to check out the new Transfer Co. Food Hallwhile taking in some inspiration from Joe Kwon of The Avett Brothers, hosted by CreativeMorningsRaleigh. Keep an eye out for SEGD RDU’s upcoming March/April event. We’re just finalizing some details before the sign-ups go live, but feel free to email uswith any questions. Until then, keep on keepin’ on. 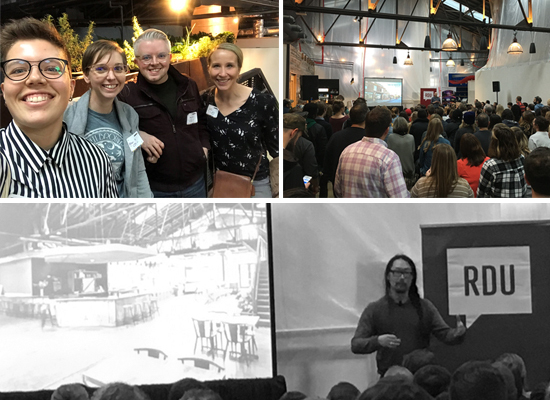 With the start of the year officially under our belts, we thought we would reflect upon the 2018 Events for SEGD RDU – our first full year as a chapter. 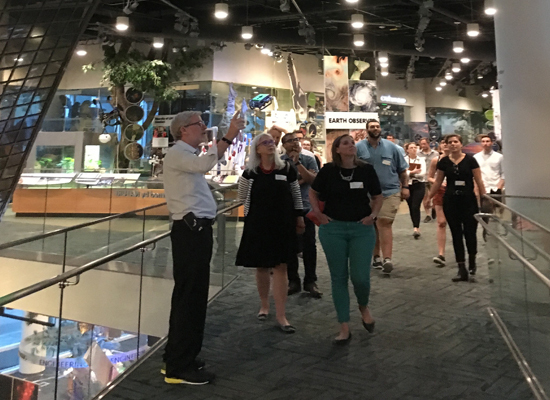 At each event, we connected with a wide range of professionals over the course of the year and expanded our Raleigh-Durham design EGD community network. Come see what SEGDis all about! We are a mix of graphic designers, architects, interior designers, digital designers, industrial designers, exhibit designers, fabricators, signage specialists, digital technology specialists, and industry end-users – the folks that seek our expertise and knowledge to enhance their environments. 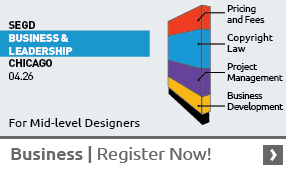 Check out SEGD’s membershipsand promotional rates for first-time members, students, newly graduated design professionals, designers, studios, design educators and industry professionals. Want to host an event or have an idea for an awe-inspiring theme, reach out to your Raleigh Co-Chairs, Emma, Allison and Elizabeth.